You are here: Home / Blog / Latest News / Free gift at our next Fab Friday & Super Saturday weekend! Free gift at our next Fab Friday & Super Saturday weekend! Our Fab Friday & Super Saturday weekends return at the end of August, with Friday August 31st and Saturday September 1st being the dates to remember. And to kick things off after the summer break, we’ve got a great FREE GIFT offer for you! 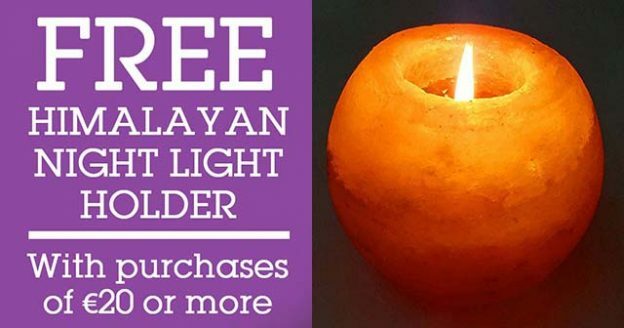 Simply spend €20 or more on products on either day, and we’ll give you an attractive Himalayan Salt night light holder for free! The night light holders have all the benefits of Himalayan Salt Lamps, albeit on a smaller scale, due to their smaller size. But if you’re impressed with your night light holder, remember we have a range of larger salt lamps at great prices too, so maybe pop back in again sometime to pick one up! Remember that this offer applies for a minimum €20 spend on products only. It does not apply for spends on treatments, tests, or therapies. €20 off Hypnotherapy. Call (053) 923 6009 to book. Ear Candling for just €15. Call (053) 923 6009 to book. Indian Head Massage at €25 for 40 minutes. Call (053) 923 6009 to book. Reflexology just €25 for 40 minutes. Call (053) 923 6009 to book. Shamanic Healing – €60 for a 90-minute session. Call (053) 923 6009 to book. Our always popular 2-for-1 Allergy Test & Nutritional Consultation for just €50. Call (053) 923 6009 to book. 20% off Pro-100 Ultra good bacteria tablets. Special offers on phone radiation barriers. One-hour facials with Josephine for €50. Go on – really treat yourself! Call (053) 923 6009 to book. CholesterolTesting just €10. Call (053) 923 6009 to book. 20% off Quinton Hypertonic – Enjoy the benefits of the natural goodness of sea water. Plus expert advice from cell nutrition expert, Laura.20% Eskimo 3 Omega 3 oil. All-natural facials with Josephine for just €10. Call (053) 923 6009 to book. Tarot Readings – Just €25 for a 40-minute reading. Call (053) 923 6009 to book. Maximum Omega 3 capsules – Two packs for just €20. You can see we’ve lots on offer on Fab Friday August 31st and Super Saturday September 1st – so don’t miss out. We look forward to seeing you!